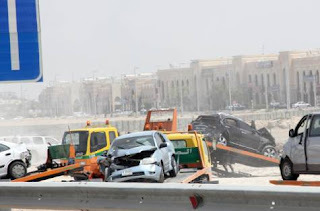 A huge car accident occurred on the Dubai-Abu Dhabi motorway, early on Saturday 2nd April in the morning betwixt Sahama and Ghantoot. There's been one fatality and 60 injured (9 of which are in critical condition), resulting in 127 vehicles getting seriously damaged. Heavy morning fog and speeding are thought to cause the incident, which caused the accident to pile-up cars for 1.2 miles (2km). Visibility was believed to be less than 50 metres (164ft), despite cars reportedly travelling at 75mph (120km/h). Miraculously, within 5 minutes, 100 police cars, 17 armed forces vehicles, and ambulances turned up on the scene. Even more astonishing, the wreckage was cleared within an hour.